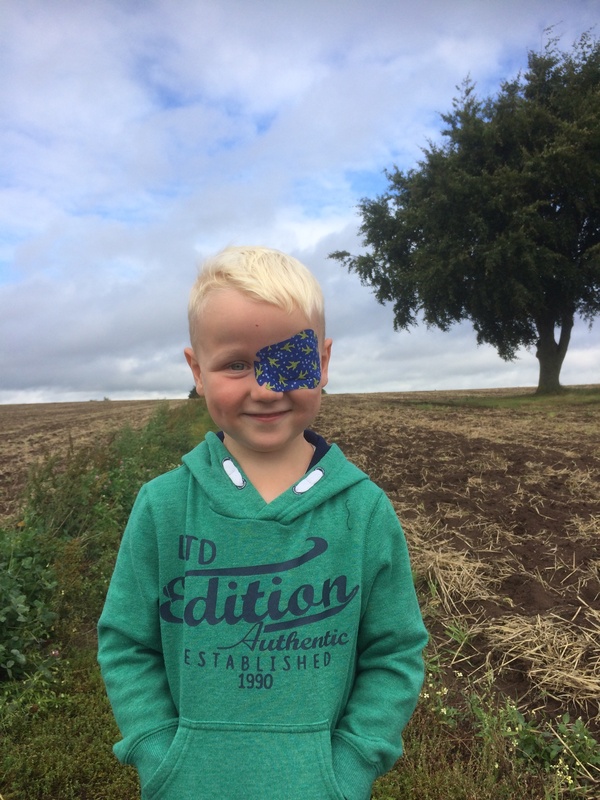 Oliver had just turned 3 when in November 2016 his key worker at nursery noticed right eye wandering, especially when he was tired or concentrating. An appointment was made with the GP who wasn’t able to see this happen but thankfully made a referral to an ophthalmologist. The appointment wasn’t until February 2017 when Oliver had also welcomed a baby brother to the family. At the appointment it was noticed that Oliver was unable to see out of his right eye. Photos were taken of the back of his eye and an urgent appointment was made at Birmingham children’s hospital at the beginning of March. During the time waiting for the appointment we read about taking a photo with a flash. We did this and noticed the glow in his right eye. Obviously having never heard of Coats’ disease but knowing about retinoblastoma we were extremely worried and managed to get the appointment brought forward a few days. The initial appointment took all afternoon, during which we had to leave our 7 week old baby with family. Oliver wasn’t happy to have so many people look at his eyes, questions asked and worst of all his pupils dilated. Once the tests had been carried out we were told we had to see a specialist. He broke the news that Oliver had Coats’ Disease and explained what it all meant. He told us he wanted to conduct laser treatment on his eye as soon as he could to stop the vessels leaking anymore. We were due to go on a family holiday the following week which he was happy for us to enjoy, so at the end of March 2017 Oliver had his first operation. This appeared to be a success and slowly over the next few months we made the decision to start patching. For a 3 year old having a patch on for 6 hours a day is very daunting however Oliver was an absolute star. Initially he could barely see but as the months went on we noticed his sight was improving. Just after his 4th birthday in September 2017 he was able to see large pictures up to 2.5 metres away. In early 2018 we noticed that while wearing his patch Oliver had started to get closer to the TV again and was also struggling to see facial expressions. On a routine, 6 weekly, eye test appointment it was noted that he was not seeing as well as in previous tests. Photos were taken and they showed there had been further leaks. In early March 2018 a second operation was carried out. Oliver does not come round from anesthetics very well so we were in hospital for most of the day as he refused to eat and also vomited. During that appointment dye was also put into his eye and the leaks worse than expected. Since that operation it is clear his eyesight is much worse, so the decision was made to reduce his patch time to 2 hours a day to stop his eye becoming lazy. In the last few weeks we have seen his eyesight yet again reduce so are expecting operation number 3 soon. On looking back through photos we found one when Oliver was 11 months old. You can just see the glow in his right eye which at the time was never noticed.